The Sundowners (1960) is a spirited love story of a hard-drinking Irish-Australian ‘sheep-drover’, his wife and son, and their nomadic family life in the remote Australian Outback. Starring Robert Mitchum and Deborah Kerr, its warm-hearted images are interspersed with scenes of the sheep-shearers brawling, gambling and pub-crawling. For the Irish connection, Tiomkin applied a lighthearted Gaelic touch to his main theme, weaving it throughout the movie along with traditional melodies like ‘Moreton Bay’, ‘The Lime-Juice Tub’ and ‘The Wild Colonial Boy’. The latter is sung full-throated by Mitchum in one of the many pub scenes: ‘He was a wild colonial boy, Jack Doolan was his name’. 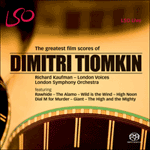 A Tiomkin biographer called the score one of ‘folksy innocence’.